Here's one that I picked mostly for the weirdness factor. 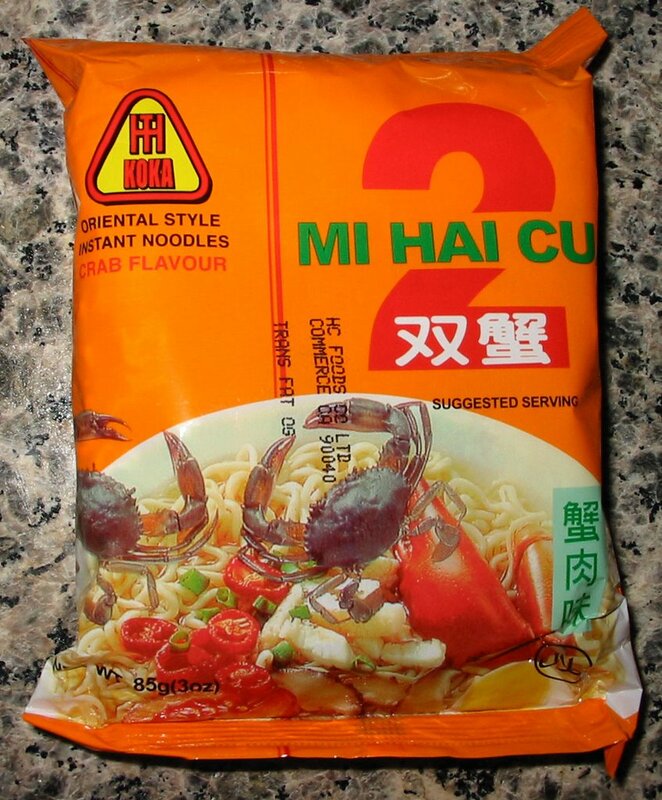 The Mi Hai Cua brand is imported from Singapore and this particular packet is crab flavoured. The picture on the cover is not particularly appetizing, showing two uncooked blue crabs (they turn red after they've been cooked). 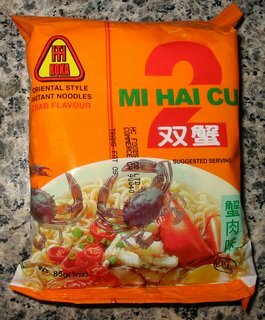 Despite previous bad experiences with Unif-100 and Kung-Fu shrimp flavored ramen, I was willing to give this one a shot, mostly just to see what it was like. Well, the good news is that the seafood flavour wasn't very pervasive. However, the bad news was that the seafood flavour was pretty much nonexistent. I won't say that these noodles were bland, but they certainly lacked distinction. 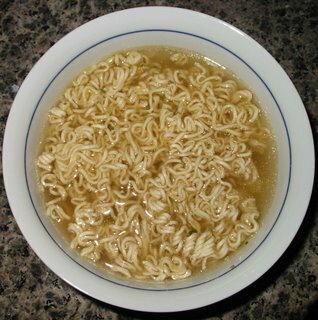 Actually, it reminded me a lot of the other two Shrimp Flavored ramen that I have had before, although this one didn't have as much fishiness as those. Overall, it was not something that I would throw away, but it was definitely not something I would buy again either. The flavor was certainly not bad, there was just really no flavor besides MSG and salt in here. My advice is to stay away from all seafood related flavors unless they are hot and spicy as well!